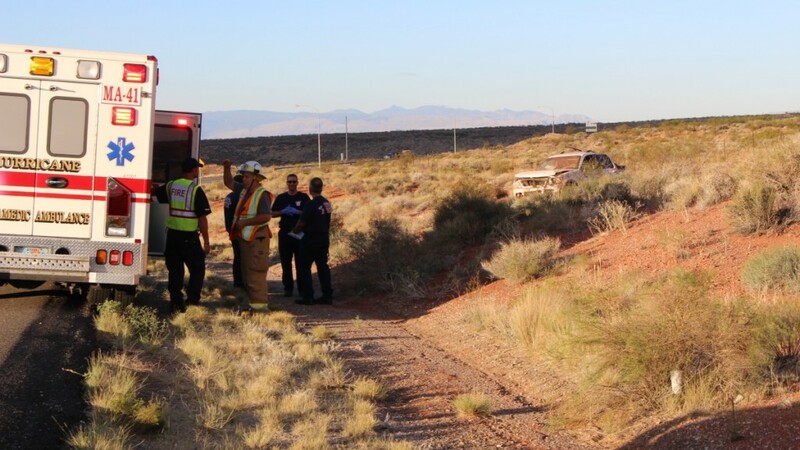 WASHINGTON CITY – The Utah Highway Patrol and other agencies responded to a rollover involving a teenage driver on southbound Interstate 15 at the Hurricane exit Tuesday mornin. 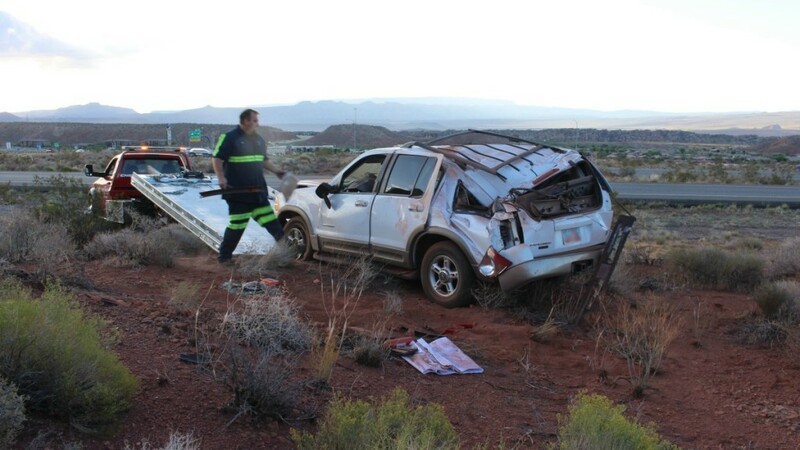 Around 7:30 a.m., a Ford Explorer SUV veered right off the on-ramp of Exit 16 on to southbound I-15 and rolled. The SUV landed on its tires, but was severely damaged. 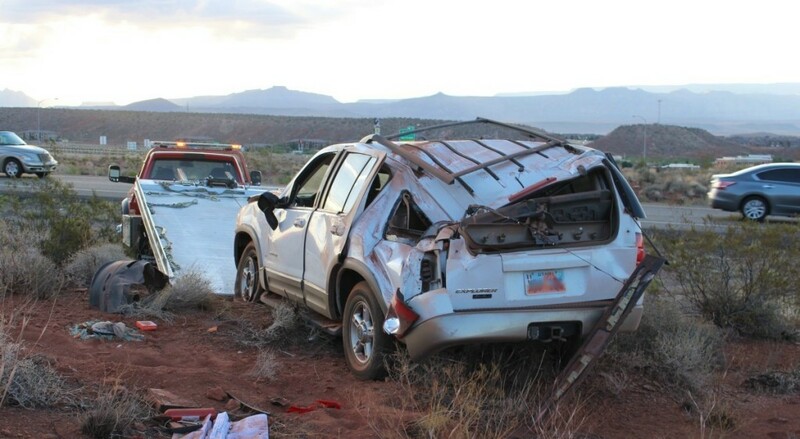 The driver, a 16-year-old girl, managed to climb out of the wreck with minor injuries, UHP Trooper Mike Murphy said. “She said she believes she looked down to check what her speed was and lost sight of the roadway,” Murphy said. The driver received a minor injury to her head and was a bit upset, the trooper said. However, the teen was wearing her seat belt and airbags did deploy. The driver was cited for failure to stay in a single lane. 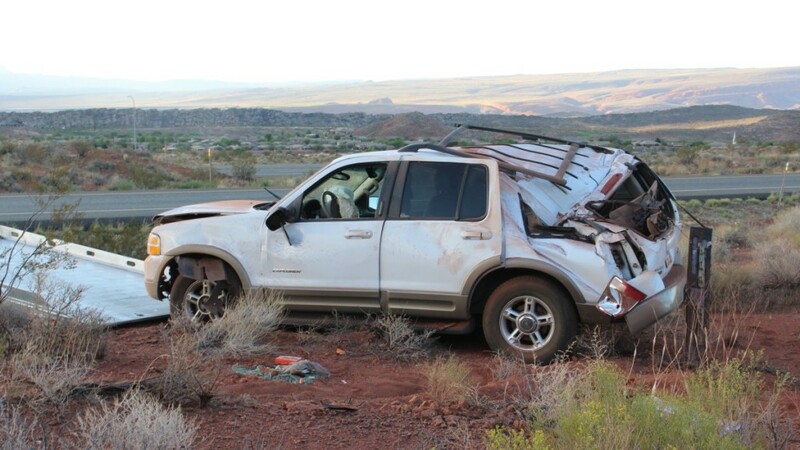 No other vehicles or individuals were involved in the rollover. 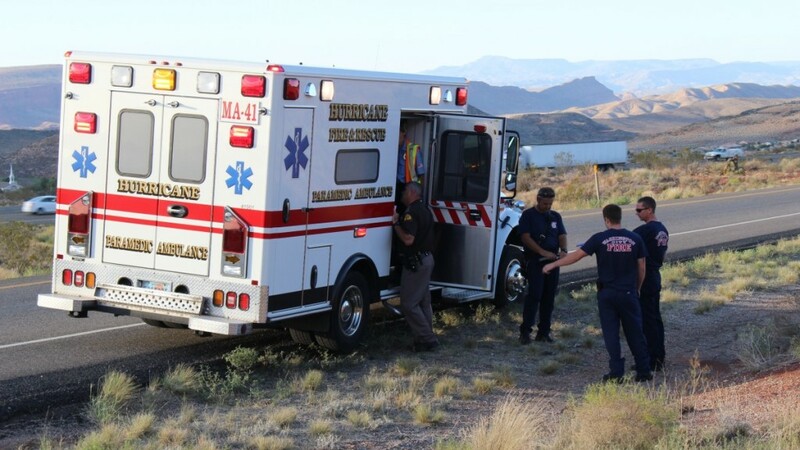 As the incident was off the roadway, there was no major impact to traffic getting onto southbound I-15. 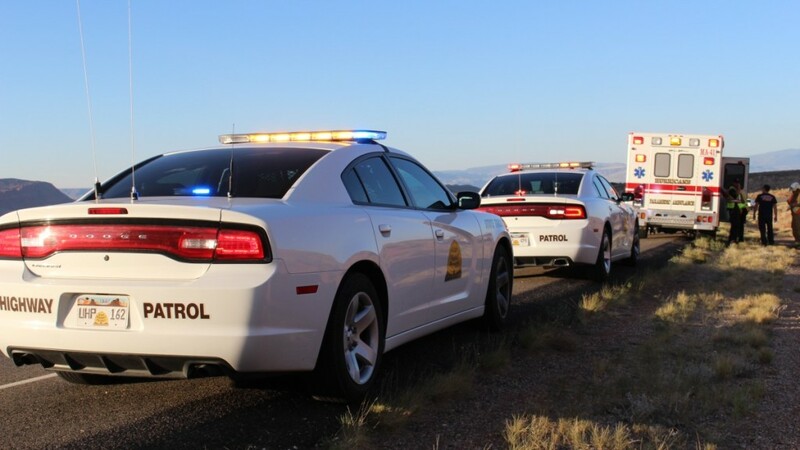 In addition to the UHP, units from the Washington City Fire Department, Leeds Area Fire Department, Hurricane Valley Fire and Rescue and Washington County Sheriff’s Office also responded. Ed. Note: Vehicle plate obscured in consideration of juvenile driver. 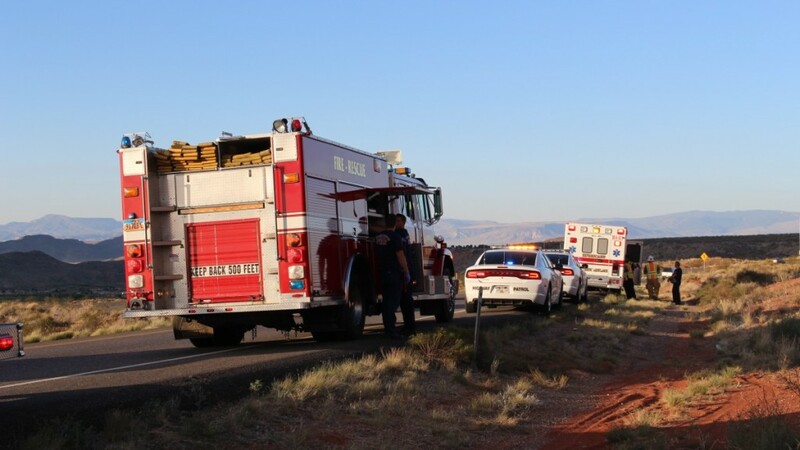 Utah Highway Patrol, other agencies response to rollover at Exit 16, southbound I-15, Washington City, Utah, Sept. 1, 2015 | Photo by Mori Kessler | Ed. Note: Vehicle plate obscured in consideration of juvenile driver. Really…..”looked down to check her speed”……better get this girl trained. No one worries about the speed limit around here, just hammer down! Before we were married my soon to be husband was over at my house. It was about 11pm when there was a knock on the dpor. We opened it and there was a neighbor standing there. He said “umm I think I just destroyed someone’s car.” We went outside and my husbands car which had been parked on the side of the street was now pushed up into my very steep uphill deiveway. It was completely destroyed. He explained that he had just looked down to change the radio station and drifted off the roadway and hit the back of the car. He was only 3 houses away from his home and driving on a snowy road that was very wide. We never did find out how fast he must have been going. He was issued a ticket which he fought and was found not quilt of. Then he had the audiacy to send a claim into our insurance for his damages. I’m sure he was also in you’re very same ward. ALWAYS ALWAYS GET A POLICE REPORT IF UR IN AN ACCIDENT. That way when the mormons try to wriggle and squirm out of their responsibility they don’t stand a chance of their lying in court being successful.